A robust, water-wise and attractive garden plant that will reliably provide colour in the garden. Amongst the best-known of the Plectranthus species is P. madagascariensis var. madagascariensis. Its herbaceous, well-branched, procumbent growth habit results in a neat and dense rambling perennial shrub of about 1m high, rooting where the branches touch the ground. Like all members of the Lamiaceae family, the young branches are square in cross-section and the leaves are opposite. The dark green leaves are broadly ovate with 3-7 pairs of rounded teeth, slightly hairy to the touch both above and below and 35-40 mm in length. 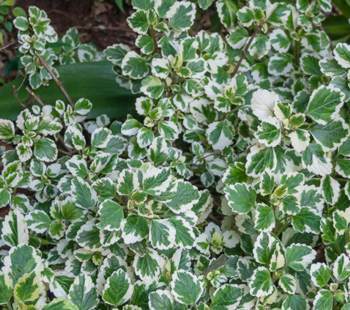 The well-known cultivar 'Lynne' has variegated leaves which are green with a striking creamy-white to pure white margin. The inflorescence is a terminal erect raceme, up to 125 mm long, bearing 4-6 flowers at each node. Each flower is 7-18 mm long, white and tubular. Despite the common name, the flowers have no spurs. The calyx is 3 mm long, elongating to 5 mm after the flower drops and holds the brown seeds or nutlets which are 1mm in diameter. Flowering period starts in early autumn and tails off in late autumn, (February until May with a peak in late March and early April in the southern hemisphere). Least Concern (LC). This species is not currently recognised as being threatened in the wild and is relatively common and widespread. Plectranthus madagascariensis var. madagascariensis has a remarkably widespread distribution and plants are usually found in shaded subtropical thicket, on dry rocky outcrops and forest margins. This species occurs from the Eastern Cape and KwaZulu-Natal provinces of South Africa to the Mascarene Islands. This species was first collected in 1775 by Philibert Commerson in Mauritius or Réunion, but must also have been known from Madagascar, hence its specific name, madagascariensis meaning 'of Madagascar'. 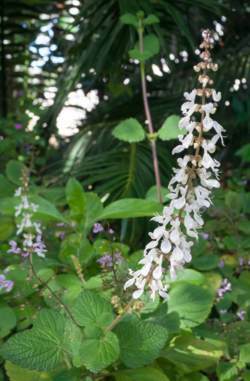 The cultivar 'Lynne' is named after Lynne Nichols who beautifully illustrated many Plectranthus species. Plectranthus is an Old World genus of about 350 species inhabiting warm tropical and subtropical climates, principally in the southern hemisphere. Its range extends from sub-Saharan Africa through Madagascar, India and the Indonesian archipelago down to Australia and some Pacific Ocean islands. There are 53 species in South Africa. 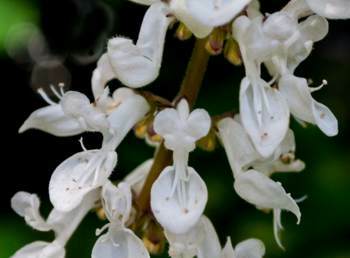 It is also closely related to the genus Solenostemon . Due to the normally pungent leaf fragrance of this species, it is not readily predated by herbivorous animals. However, the larval caterpillars of a number of species of moths and butterflies thrive on the leafy parts of the plant. It is not known what the pollinators are. During the dry winter months, Plectranthus species have the ability to survive extreme drought - they simply wilt and remain in a state of flaccid semi-dormancy until it rains again. This characteristic makes them excellent horticultural subjects. This species in particular is well-adapted to dry conditions and could be classed as semi-succulent. This species is used in traditional medicine to treat coughs, colds and scabies. 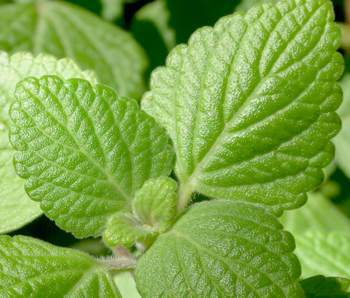 The pungent leaves and branches of Plectranthus species in general are sometimes hung around the home or rubbed on window sills to ward off flies. Plectranthus species are among the easiest and most rewarding of all plants to cultivate and this species is perhaps among the easiest. Cuttings can be made at any time of the year, but preferably in summer, consisting of short pieces of stem with about 3-4 nodes. Remove the biggest and softest leaves from the cutting. No rooting hormone is required. If provided with some protection, cuttings can be stuck directly into the ground where the plant is ultimately to grow. This method works as long as the cuttings are watered every second day during the first two months. 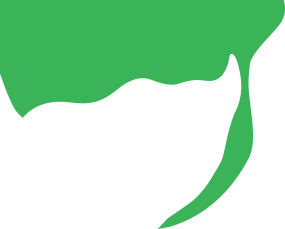 Alternatively, cuttings can be struck in any rooting medium in pots or cutting trays under the protection of a nursery structure or propagation bench with regular watering or misting. It is best to propagate the cultivar 'Lynne' from cuttings to retain the variegation. Seed can be sown in a well-drained seedling mix. Cover seeds very lightly with a thin layer of pure sand. This can be done at any time of the year but the warmer summer months are best. Germinated seedlings often outgrow cuttings of the same age and are frequently more robust in their growth habit. The seedlings should be pricked out when they are a few months old and either planted into the ground or potted up. Plants grow quickly and if planted in spring they should achieve a reasonable size by flowering time in autumn. If planted late in summer, they may not flower in their first autumn. They prefer lightly shaded conditions. Pruning is not really necessary with this species but is recommended occasionally to rejuvenate the plant and restore the preferred shape. Plants don't require much additional nutrition but they can be fed with a good layer of compost and/or organic fertiliser. They will sprout vigorously again in early spring. They require very little other maintenance apart from occasional watering once every few weeks. Caterpillars and snails seem to be its only real enemies.